Countless studies have shown whitening to be completely safe for your teeth – when it’s done professionally. A cosmetic dentist will use a professional-strength product that’s been thoroughly tested to make sure it’s not only safe, but effective as well. In addition, they’ll evaluate your specific needs to make sure you’re using the best treatment and will be there to guide you through the process from start to finish. Unfortunately, whitening isn’t permanent for anyone. First, everyone’s teeth get darker with age. Also, your teeth are exposed to foods and beverages each and every day that cause staining and discoloration over time. The good news is that professional take-home whitening includes custom-made trays that you can re-use indefinitely. 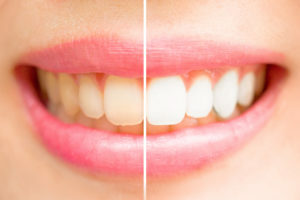 Most people need to touch-up about once a year, which you can easily do by getting another supply of professional whitening gel from a cosmetic dentist in Benbrook. Hydrogen peroxide – It’s true that hydrogen peroxide is an ingredient in many whitening products, but using it by itself in pure form doesn’t work. Charcoal – Charcoal is very abrasive and will remove surface stains, but it won’t change the color of your teeth. It’s also harmful because it significantly wears away at your enamel and can actually cause your teeth to look more yellow over time. Fruit and baking soda – Combining the acids in fruit (such as lemon) with something abrasive like baking soda can seriously damage your teeth. It will quickly wear away your enamel, ultimately leading to the need for extensive dental work. This myth probably stems from the fact that whitening can cause temporary cold sensitivity in some people. However, modern professional treatments have come a long way and don’t cause nearly as much sensitivity as they used to. In fact, with professional whitening, you’ll get up to 8 shades whiter with little to no sensitivity – and zero risk to your oral health. And you won’t have to use pumice or vinegar like the Egyptians! If you’d like a whiter smile, Dr. Mark Givan is here to help. With many decades of experience as a general and cosmetic dentist in Benbrook, whitening has been one of his most popular cosmetic procedures because it provides outstanding results in a short period of time. If you’d like a brighter smile and have any other questions, he can be reached via his website or at (817) 900-8320.